No.2 on my list is leopard. I love leopard and experimenting this with colors is upto you but i prefer to stick to the classic look. So all you ladies get the leopard out. No.3 is peplum. Yes it is still hanging in there. I see it in quite a few designer looks. Definitely try to play up your waist as this is a kind of a dramatic opposite ends where we have an oversized thing going on and we also have something more tailored. No.4 is playing your waist with texture No.5 is Furs and leather. They are back with a bang. Knits and tweeds is also very in and try any kind and spice it up. Its all about texture and all about drama. No.6 is new as its a new combination of charcoal and white. I am seeing a ton of charcoal and ton of winter white. It is almost a remake on the traditional, as we all know traditonal being black and white. Winter white was in vogue for last fall and it is coming back. Fur is all over the place tailored at collars or patch work on dresses. Pick it up and make it as dramatic as you can get. faux or real go for fur. No.7 is 1940’s glamor. Hemline dresses. a skirt or dress with hemline is right below the knee and above the calf. 40’s has a very basic tailoring and the only tailored part is the waist and the rest is very straight fit. No.8 is matching sweaters and skirts. Pairing these things together seems to be the “It” thing. The thing i love though is you play with the texture. A chunky cable knit sweater with a satin skirt is my fall 2013 pick. You can also go with a velvet skirt with a ribbed sweater. Applicate skirts, turtle nects to V-necks and it dosen’t really matter what type of sweater as typically they all have sleeves. I also love the monochromatic look. Good example is all winter white look. No.9 on my list is biker jackets. Biker jackets are still here and the amount of drama it creates with just one piece is significant to turn heads. Last but not the least is No. 10, which is to cary your own attitude. I am so excited to be rocking so many of these styles and hope this is helpful for you guys. 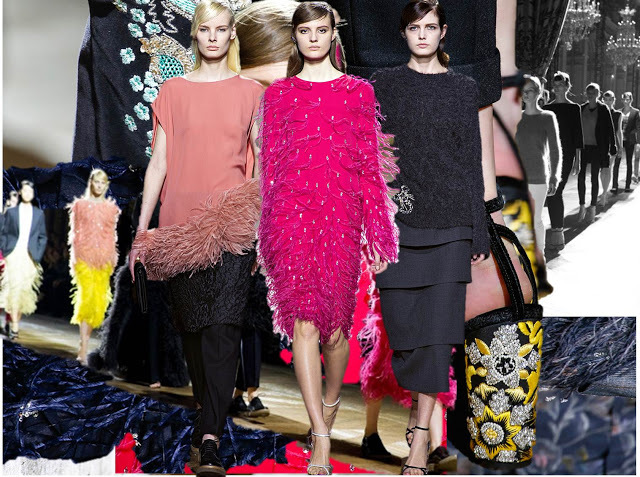 Remeber Fall 2013 is all about being DRAMATIC !